This is a guest post from Aaron Henckler. Waterfall charts are great, especially for visually showing the contribution of parts to a whole. While there are several tutorials on how to make a waterfall chart online the end products of these tutorials rate low on the visually appealing scale. Many users of waterfall charts employ the separated (default) version (example B) opting to add in element connectors manually via Insert>Shapes>Line on the Excel tool bar. The frustration with this approach is that all too often the values of the chart elements will need to be updated or changed forcing user to manually readjust each of their connector lines in turn. With some simple charting trickery in Excel 2007 one can easily make a waterfall chart with connectors that will update automatically as element values are changed. 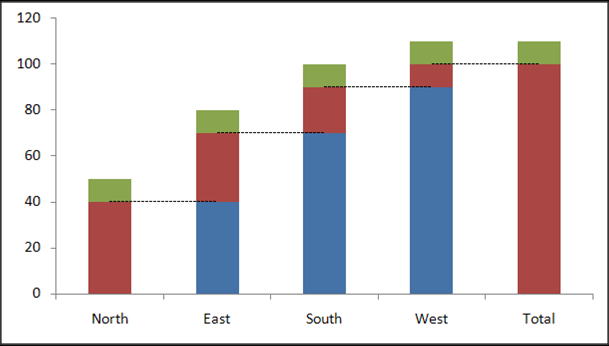 Horizontal Axis Labels: in the example above North, East, South and West. Base Values: What your element values will “sit on.” Essentially this is the white space beneath each charted element shown above. Element Values: the meat and potatoes of your chart – the value of your elements as you want them to appear (above these are 40, 30, 20, 10 and 100). Label Spaces: This is optional but it allows you to place the value of you data elements on top of their respective bars (this avoids the use of the annoying Label Position options available after one has used Add Data Labels). Label Connectors: This is the key item needed to create the chart as shown above. You will need one column (series) for each of the data elements (excluding one for the total). For the chart above, four label connector series are needed. Base Values – A running total of the subsequent Element Values (Column C). Whereas nothing proceeds North in the example above leave its base value blank. Do the same for Total. Element Values – These are whatever numbers you want to highlight in your chart. These are represented by the blue column segments in the above chart. Label Spaces – Again this is optional. These will eventually hold text labels for the Element Values (Column C). The numbers here should all be the same and be some number about 1/4 to 1/3 the value of your lowest Element Value. (to H. ) Connectors – Connectors 1 to 4 correspond to Axis Labels North to West in the example above. In the respective Connector column make the cell at the row corresponding to the related Axis Label equal to the sum of Column B + Column C (Base Value + Element Values). Enter the same value for the cell beneath. 4. Follow this up by formatting each connector in turn. Right-click on the connector and go Format Data Series…. Consider making the Line Color>Solid Line>Color black, Line Style>Width .25 pt and Line Style>Dash Type>Square Dot. Play around with these options as you see fit to get the best look. Again, do this for each connector. 6. 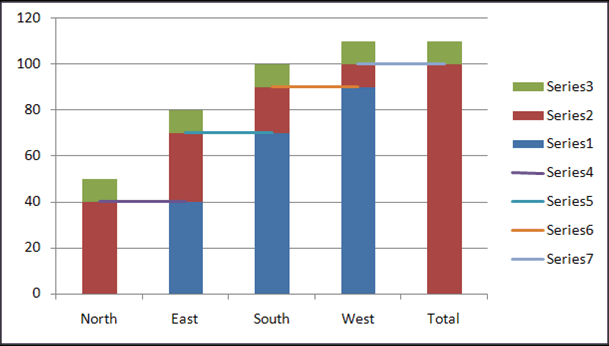 Go into you Base Values series (blue column element in the chart above) and eliminate the color fill and borders: right-click on a blue column element and go Format Data Series….>Fill>No Fill and Border Color>No Line>Close (to exit). 7. Format your Element Values series (red above, using same process in Step 6 to change the fill color and add a border. 9. All that remains is to convert your labels to the values of the Element Values. To do this for each label: click on the specific label twice (so that only the box for that label appears, as below). I hope you will agree that this waterfall chart is more visually appealing that the examples at the start of this tutorial. In addition to a more professional look this waterfall will fully update (step heights, labels, connector positions) automatically whenever you change your Element Values. While the process of implementing this form of waterfall chart may at first seem cumbersome it can be quickly implemented with some practice and is a great item to have in your charting toolkit. Enjoy. Thank you so much Aaron. You have taught us a very valuable tutorial. I really appreciate your effort in putting this together. If you need to make a lot of waterfall charts, I recommend trying Jon Peltier’s Waterfall Chart Utility. 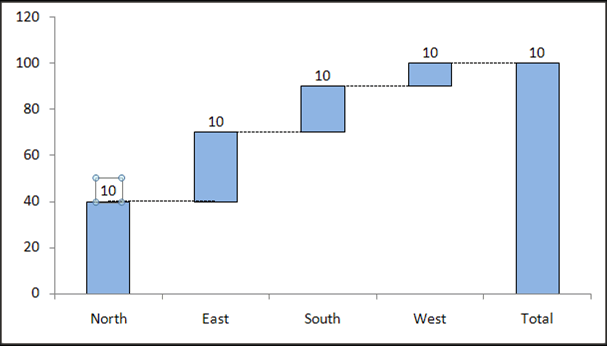 Hello there, Reader: If you like this waterfall chart tutorial, please drop a note of thank you to Aaron through comments. Waterfall charts are best employed when a stacked bar (or, as I cringe, a pie chart) won't suffice because some of the "contributors" contribute negatively. This example is very helpful to get the basic technique down, but some extra math and series would need to be added to accommodate common waterfall chart applications (cash flow analyses, marketing mix, etc.). Jon's add-in does this, I think (at least, based on the screenshots). It can be done without an add-in, but it takes a moment to get the math down on what you're referring to as 'Base Values' in this example (the transparent spacer series). This is an incredibly useful program. In my job, I have found several uses for it already! Thanks Aaron for taking th time to educate us! Hi, nice tutorial, thanks Aaron and Chandoo. This also works in 2003, although some of the stages are very slightly different. One possible improvement - some of the connecter lines may look as if they are slightly out of step with the blocks - in the final chart the one between "north" and "east" looks slightly too high. I also got this when I followed the tutorial. You can play around with borders for the element series - either turn them off completely, or make them the same colour as the fill colour, and play around with the line weight. If that doesn't work, consider adding in a small number to the connector values to offset them slightly. Thanks for the post. We use them all the time. As noted in an earlier comment, it would be great to adjust this so it can handle negative values, and color-code the negatives in red and positives in green. This approach does not have Chandoo's nice connector lines - but it is easy to implement. 1) The up/down bars are based on the first and last series provided. You can add the line connectors like Aaron's chart has by adding a series for each line segment to the middle of the data table. Could be an easier way to do this, but hey... this worked. 2) I didn't like that the first datapoint (2008 in my example) and last (2009) were the same color as up bars. I see those as absolutes, and the up/down bars should be for the changes (Chg1-4). So, I added an absolute volume series (named Vol) and changed its chart type to Bar. 3) Using the same trick that Aaron explains, you can also add data labels. I didn't. OK, guys: I didn't get it at all, but God knows I've tried to !! I can't download the sample @the office, but I'm wondering if you can lead me thru this example: I have a list of countries on col C, values for each Line Of Business on clos D and E, and total in col F.
I'd like to create the waterfall chart to show how each country contributes to the total. PLease disregard my previous post, I think i hadn't enough caffeine on me.....i totally did it !! @Martin: Cool. Here is to Coffee and passionate users like you. Cheers! I've actually gone a step further, and combined the chart with a data validation filter, and the result was really impressive, a dynamic waterfall chart, without a single macro line !!! Commenting this with a colleague form Finance, he mentioned that in this case (showing info from offices and getting to a region total), waterfall might induce to a confusion, as one might be tempted to understand that a certain office's numbers is based on the previous shown, and reluctantly, i had to agree with that vision. Still, I love the results !!! Outstanding tips. I never experiment that much. Thanks for this nice tutorial. Next time I definitely teach my younger brother about it. Again thanks. I wish I could use waterfall charts with pivot tables and Dynamic number of data elements (which is why I use pivot tables). My main issue is related to data elements. I have charts I update every month for every project. So each project has its own set of charts (same charts with each project). However, each project might have 0 to 12 data elements. And every month the number of data element can change for each project. I do not see how I could do waterfall charts without a lot of work when I change the number of data points. @Brian... One idea: you can take the above tutorial and create waterfall chart with 12 bands and then save it as template. 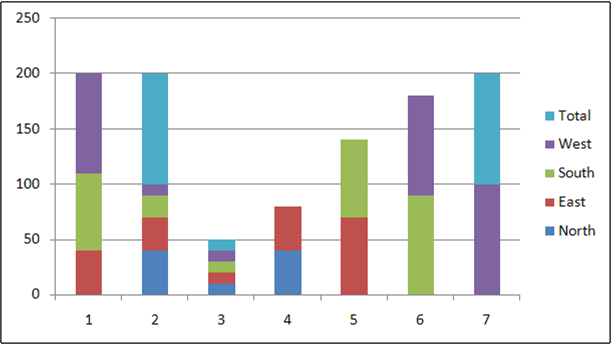 Then next time you need to use a waterfall chart, just use it and set the blank elements as NA(). Another option is to try Jon's utility. It is a pretty good tool and takes care of most of this work automatically. 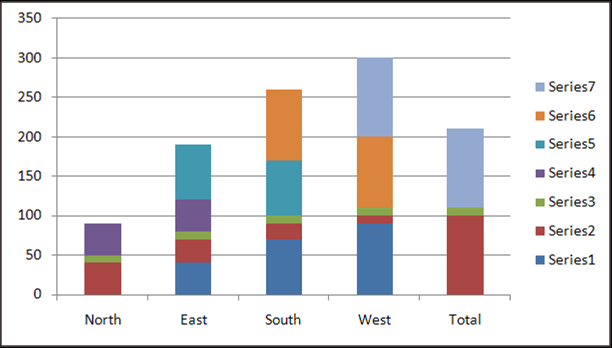 there are some examples for waterfall charts. if you mouse-click on the chart you can download the corresponding xls-file. have also a look on the new poster HI-SUCCESS-Rules for information design. This is the best tutorial on Waterfall Charts! @Chrisham.. no arguments there, Aaron really did a splendid job on this one. Another firsts of its kind though there are many who claim to have prepared the first free version of waterfall charts and want their name to be entered in Guinness World Records but I've seen none. To add another wrinkle, any thoughts on how to go from negative to less negative to positive numbers? We have a quarterly loss, trying to go from the GAAP to non-GAAP adjusted, which goes from a loss of 500 to loss of 100 to profit of 400 for example. @Jeff... I am not sure, but waterfalls are not ideal for showing negative bars. But I have a weird suggestion. Try changing the axis settings so that horizontal axis crosses vertical axis at -600 instead of 0. See my comment from August 11, 2009 and Seth's followup the same date. Nice simple approach that accomplishes your objective. An excellent alternative is to get Jon Peltier's Waterfall add-in - it does everything. It can be pretty easily adapted for changes which involve declining values by altering the base to always be the lowest number in the two connector series and using the absolute value for the Element Value. I've come up with an improved template that handles negative values just fine. I'll see if I can figure out how to post it. Hmm, can't find an easy way to share the file. If anyone's interested, let me know. Basically, you paste in three columns: labels, before, and after. THe excel I made up witll produce a waterfall chart with a starting and ending total, and provide green/red step bars, with dotted line connectors, for positive and negative deltas, respectively. The filds highlighted in gray are all formulas, so don't need to be touched. It's not the cleanest (I should be able to condense it a bit), but it works for now. Thanx! This is really helpfull and it works great in 2003. I was adjusting my graphs in Illustrator to get the message right :$ This is much more convenient and looks the way it should look. The link is gone ; can you please re load, thanks! For animated waterfall charts you can try http://www.fusioncharts.com/powercharts/charts/waterfall/ (This is one of the best product created by an Indian guy when he was 17 year old). I also checked his latest speech at Nasscom Emergeout Kolkata on 28th, 2011. They have clients like Google, Facebook, US Gov etc. Thought of mentioning it here :), great work! GREAT tutorial. Was able quickly replicate and then adapt for my uses. The post is Nice & useful. But only for ascending data. If any fall will come into account then this template would not support. So if possible then Guide for Any fall between the raising Data. Great post this and thanks for that. However I'm stuck in the last step and cannot link the label value to the element value. I'm using Excel 2010. Any help ? Spoke too soon ! I was typing in the label box instead of the address box ! Works perfectly now ! Can this be done in Excel 2002 (what my company has). It seems to fall down for me in step 3, as there doesn't appear to be an option in Excel to convert the series to a line. This just made my life a whole lot easier today. Thanks so much for sharing. Some of us have NO talent for this type of thing and when someone like me can make this work...all I can write is: May Many Good Blessings Fall Upon You! Thank you so much for putting on web these easy to follow and clear instructions on creating waterfall charts. I have just done two and it was quite simple process. Will come back for more tutorials! Hi Todd, could you please re-upload your waterfall chart to deal with negative value? Hi Todd - Can you re update your waterfall chart? I am attempting to chart negative values in the midst of positive values and am having a hair raising experience. Could you please repost oyour waterfall chart. I am attempting to chart some negative values in the midst of postivie values. It is truly a hair raising experience. Tina - please see comments 6 and 7 above. This is cool! Thank you so much for sharing. Of all the approaches I explored, Aaron's is the easiest to understand. GREAT post! I used to be a consultant and had this macro automatically built into my powerpoint program. I'm in a new job now and was so happy to find this tutorial to be able to show this kind of analysis again. Thanks!! This was very useful and well explained. I followed the steps and did it all myself. Chandoo - I am using Excel 2010. Was able to navigate the tutorial without a hitch until the end. I cannot get Step 9 to work. Any advice? "Click a third time on the edge of the box that appears and then type the equals sign “=”. Now go back to your data table and click on the cell of the Element Value that you want appear in the label. Then press enter." there is not any critical plus and minus data for water fall chart so if its possible then plz add some increasing and decreasing value typ chrat....and thanks for ur tutorial.. Superb stuff. Always wanted to know how to do this. very much appreciated. I used to to these kind of charts by myself before, but it took me a lot of time... My company has just installed an excel add-in, which allows you to make a rather nice and very easy to make waterfall chart; it's called Upslide (www.upslide.net), and it's rather great! Great tutorial. Had to fiddle about to display negatives properly (subtracting them from the base)- but looks good. Thanks for taking the time to post this. I don't know why companies never really teach you how to use the basic software you are provided with; I always feel like an XL dummy, but this waterfall diagram trick is pretty nice and worked for me. I have seen business development folks reduced to drawing them in powerpoint, which takes ages and if you need to make a change that causes some sweat and tears. Now I, a mere R&D guy, can get nice value proposition waterfalls for projects and change them painlessly too. Thanks for the post! I have a two row and 7 column data and i have followed the steps as per the tutorial. But i am not able to implement 3rd step while doing it my one of the data vanish. I tried it with all colors, and ultimately my chart got blank. I've been running charts like this for a couple of years in Excel 2002. I have it set up as a template for others in my prior department to use in their presentations. It's quite versatile and works for them well...but the labels all fail in Excel 2007. I've got labels that are not manually linked as described above, but rather I've created addtional series to hold the labels. The Y value is the Y value of the series I'm labeling, and the x-value is the TEXT version of the gap number I want to label. Then I set the label to show the x-value. Since the x values are text, they align with the other series' x axis and it has been working flawlessly. Any way to automate labeling like this in Excel 2007? Shy of an add-in? You enter your data, and receive a waterfall as an Excel file. Besides, the labels are nicely handled. You may want to try, too if you have to create many waterfalls or create perfect waterfalls fast including negatives. Wow, this was the most helpful and easy to follow set of directions I have ever found! Thank you so much!! I wanted to automate this process so wrote a little sub to take care of it. However it won't handle negative values or a falling waterfall chart (only rising). They are on my todo list. Selection.Formula = "=" & ActiveSheet.Name & "!R" & i + 1 & "C3"
Then select the data and run the Sub. 2012 Budget Bridge in picture form. Thanks Man!!!! Brilliant! I really liked the waterfall chart! Will be coming back for more! "Click a third time on the edge of the box that appears and then type the equals sign “=”. Now go back to your data table and click on the cell..."
There's no way anyone could discover that on their own!! Wow.. never thought there's a tool to make me easier to analyze the growth of my company..
thanks a lot!! you're such a great help! Thank you so much! This is a wonderful tutorial and very clear even for an excel-challenged person such as myself! Thanks a lot.. Extremely useful post..saved me a lot of time and trouble. How could I show more visually the third component of the waterfall chart is heavily dependent on the first and second? I am trying to 'build a story' that the starting point (jump off point) for this year to next (final number) is dependent on three main components A, B and C. But C is dependent on success of A and B. So while the waterfall chart shows that A, B and C are component of from getting from this year to the next but it does not show the relationship between A and B with C.
Any idea how to do this more visually and powerfully? How to you get the waterfall chart to work when the variable goes below the x axis? Lets say you are looking at how sales have translated into negative profits. You have the main sales bar and progressively with expense categories it goes below the line. The series that goes below the line will be part of the same series that you are removing in previous items e.g cost of sales to create the floating effect. Therefore I am left with nothing below the line as that series is artifically removed. Hopefully that makes sense. This is a great example of using the classic set up for the waterfall chart while adding the connectors. This is actually the first time I have seen connectors used in the waterfall. Hi, thanks for the post it's helped me create something more meaningful than what I was using previously. I'm stuck on something though, I'm using Excel 2007 and trying to add the horizontal lines between certain points on the stacks that show up as dotted on your chart. Can anyone advise how I can go about adding these using the options in Excel? It's free and seems to handle all the weird cases. Thanks guys, this really helped me in understanding and creating a good waterfall graph. I'm just dropping by to let you know, that I've visited this post numerous times to help me with with my waterfall charts. It was really helpful data. alothough it was difficult to implement on mulitple data but managed to do that. Thanks guys 🙂 its 2nd July, 2014 and this article is still very relevant and helpful! Took a little reading up but I managed to edit it and expand it to cover more range, awesome! Great help, my boss ask me to prepare and it was easy. I was struggling with some data and was not satisfied with the presentation, made it in waterfall today. Thank you for the post. Everything works great with the tutorial but when I decide to insert another row into the table (e.g., if I was to add another region to the above table) the corresponding chart breaks in that the connector with the new bar is not visible and I can't seem to find a way to create it. I end up recreating the chart from scratch. Any help would be greatly appreciated. A really nice step by step way of producing a waterfall chart. It all went well when I had positive values , however, once I had a negative value, the relative bar was shown below the X axis. Any solution for this ? This waterfall chart doesn't work for negative values. How do you show a negative value? That is a basic waterfall chart. 2. Use Excel 2016 which has waterfall charts built in. @Matt. Please see my comment from Aug 11, 2009 (6th comment from the top above). Nice simple way to handle waterfalls including negative values. The following comments from Seth adds some nice enhancements. Of course, Jon Peltier's utility is the best. Many thanks. Excellent post. It was really useful for me. Thank you!! This is very well explained and visually useful 🙂 helped me a lot! Thanks again!! Could you kindly send me the waterfall chart in pdf format by email please.